The Rapid PT program relies on a Paleo-like diet to ensure that a person improves their PT performance. But, for many people, changing their diet to avoid energy-dense, disease-causing modern foods can be hard. The idea that they will never eat a Papa John's pizza, McDonald's hamburger, or a Butterfinger ever again is just too much to bare. But, determined to improve their health, they commit themselves to a new way of eating. Soon, the extra weight comes off and they start to feel fantastic! However, within a couple of months some find that the new diet makes it more difficult to resist those delicious energy-dense, disease-causing foods. These formerly committed dieters start to indulge more and more in these unhealthful foods. Predictably, as they revert to their old ways of eating, they start to experience all the negative effects they were hoping to avoid (fat weight gain, indigestion, bloating, insatiable hunger, low energy). Very quickly, they rebound: They end up right back where they started, often with a couple of extra pounds for their troubles. If you have fallen victim to this kind of yo-yoing in the past then one way you can stop this problem is by enjoying a single cheat meal once a week. This meal, which allows you to eat whatever you want, can be used to help sustain your diet changes for the rest of your life. The beauty of a cheat meal is that you get to indulge your unhealthy cravings once a week. As amazing as it seems, sometimes you need to take a break from foods like grilled steaks, broiled seafood, roasted chicken, steamed vegetables, and freshly cooked white rice. When that happens, push your cravings off until your weekly cheat meal. When that meal comes around, satisfy one of those cravings. A cheat meal can also give you something to look forward to every week. Almost like a reward for all your hard work and "sacrifice." 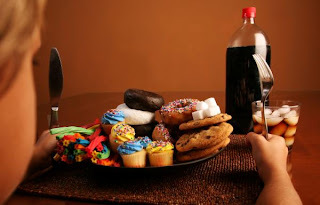 As you start to clean up your diet, you will likely realize a voluntary calorie restriction. Essentially, you just aren't as hungry as you used to be, resulting in fewer calories eaten. This voluntary calorie restriction also allows you to effortlessly lose weight every week (usually a steady 1-3 pounds of weight loss every week until you get close to your ideal body weight). The trick to avoiding these negative hormonal changes is to periodically simulate abundance. When your body experiences a calorie deficit for too long, even if this deficit only results in the loss of just a pound or so per week, then your body can trip into starvation mode. When your body thinks that it is starving, then it will aggressively defend a given weight. You will see this as a stubborn weight-loss plateau (where no matter how hard you try, you can't seem to lose any weight). However, while you lose weight, enjoying a cheat meal once per week can make your body believe that it isn't actually starving. This can keep (or correct) cortisol, testosterone, leptin, growth, and thyroid hormones at levels that will allow you to enjoy continuous, long-term weight loss without rebounding. It can also boost your metabolism. In case you were wondering, eating crappy comfort foods once per week will not kill your health. Your body can tolerate a lot of abuse, so long as it has enough time and nutrients to recover. It can easily recover from a single indulgent meal, once per week. However, your body cannot recover when these cheat meals comprise every meal of every day. Just be careful: It's easy to keep on cheating if you don't go back to eating your healthful meals for the rest of the week. To keep on track, make sure that you stick to the rules outlined in this post. If you find that you can't limit your cheating to just one meal per week, then you might want to avoid the cheat meal altogether until you start to plateau. Want a couple slices of pizza and a normal soda? Go ahead. Two helpings of mac and cheese? Have at it. So long as you are only cheating for one meal per week, and you only cheat at the end of the day (no cheating during the morning or afternoon), then eat anything that you've been jonseing for. On the next day, go back to eating healthfully until your next cheat day. Six days a week, you eat "normally," which means that you eat healthy, nutrient-dense, toxin-free foods that will automatically revitalize your metabolism, eliminate excess fat weight, build muscle (if you exercise), and allow your body to perform the way you want it to. On the seventh day (which is usually on a Saturday or Sunday), you eat breakfast and lunch like the other normal days. For diner, eat whatever you want. When you go to bed after your cheat meal, you can no longer eat crap food until next week. You don't have to use a cheat meal, it's just an option to help those who are getting used to a new way of eating. Once you get used to your new diet, you may find that you look forward to your cheat meal less and less each week. If you don't want to eat a cheat meal every week, then ditch it! You can then just cheat during special occasions (e.g., birthdays, Christmas). 1. Miyaki, Nate. The Samurai Diet. s.l. : Self-Published, 2011.